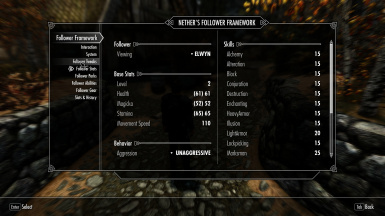 Nether's Follower Framework is a multi-follower system that is light on game resources and allows for up to 10 companions at one time. It provides a wealth of additional features, including immersion and quality-of-life functions to allow you to adventure with a small team of characters. More Saddles for NFF Follower Horses The wonderful mod that lets followers ride horses, and do many other awesome things! Small code chunk used from confusedchim's Simple NPC Outfit Manager. - Reverted Enhanced Sneaking functions to work as in 2.2.7. No longer attached to package, on main controller as before. Was bugging out and not working on followers randomly. - Tweaked Horse Travel package to work more consistently. Not a complete fix but should be better. - Adventuring Gear should no longer fail to finish the equipping process, causing items to disappear. - Adventuring Gear dialogue now launches 1 second after asking a follower to wear items. - Corrected an error in TrapBear.pex. - Sneak AI package corrected to only have followers ignore combat IF the player is not in combat. Once the player enters combat, they should react accordingly. - Taunt Effect should ignore dead opponents. - Enhanced Sneaking ability and effects are now attached to the Sneak AI package. This means that Enhance Sneaking requires Improved Stealth AI to be active but it makes the ability less problem-free and more efficient. - Updated Save/Load configuration to include some missed settings. - An attempt to fix some issues where followers will dismount when the player goes into combat but they are rather far away, causing them to run a long distance on foot. This adds an additional package that ignore combat while the follower is mounted until they get within 1600 units or so from the player. It may not work perfectly well at this time. - At the forge, under the Jewelry section, you can now craft a "NFF Ignore Token" for followers. This can be traded to a follower. While in their inventory, they cannot be imported or exported. This simulates a blacklist feature. Tokens have no weight or value. - Taunt now reinstated to be checked every 4 seconds while in combat (cooldown must be completed). - Friendly fire/aquiring targets now checks every 4 seconds. It is fairly fast and non-spammy. - BYOHHouseBuildingScript vanilla script removed. The only "base" vanilla scripts that are changed are now: DialogueFollowerScript, FollowerAliasScript, WEDogFollowerScript, QF_DialogueFollower_000750BA. Of course the other fomod options will change/replace other scripts. - PF_nwsFollowerBrawlWatch_03167D3E script removed. Wasn't in use. 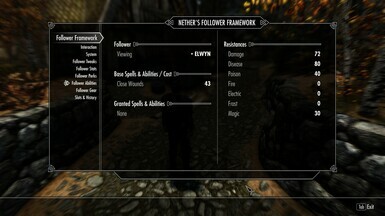 - nwsFollower_StealthPKS is a new script attached to stealth package that handles follower Enhance Sneaking. - You can now adjust the Hiring Cost for Expendable Recruits. This is displayed in dialogues when talking to them about joining you. Mid-range rate is 60% of the value you set. Low-range is 30% of the value. - Taunt Visual Effect can now be disabled. If you experience the visual effect knocking around objects in game, disabling it should stop this behavior. - You can set the length of time that bleedout lasts. The game default is 15 seconds. This DOES affect all NPCs that are able to go into a bleedout state, not just followers. - Resolved an issue where acquring a combat target results in it being perceived as a dead actor and causing papyrus errors. - Actors that are bleeding out can no longer be acquired as a combat target. - Combat checks are skipped if the follower is bleeding out. - Combat checks are skipped if a check is currently processing (stacking). - Only actors that are hostile to the player or the follower can be considered as combat targets. - Added double-check for Dead/BleedingOut on Taunt Enemies Effect. - debug messages removed when starting a sparring match. - Corrected a translation file issue. - It is announced in-game when a follower has died. - Imported Follower will no longer be auto-dismissed while the player is mounted (Convenient Horses compatibility). - Fixed an issue where Teleport on demand not working if Auto-Teleport was off. - Toggling Auto-Teleport in the MCM now refreshes the page. - Fixed an issue where setplayerteammate gets reset to 1 prior to combat during a sparring match (it needs to be set to 0 temporarily). Possible game bug due to scene interference, so now delayed until after scene start. - Player can now interact with followers while they are avoiding/moving out of the way. - Moving the sandbox marker now takes height into consideration. - Follower Follow Package: No Combat Alert flag is now on (skips alert state). - Healing AI: can now heal imported/hired followers. - Healing AI now correctly uses caster's Restoration skill as a healing bonus. Furthermore, healing bonus from Restoration is now 20% of skill (down from 25%), however, level is now added as a healing bonus (i.e. a 40th level caster heals a bonus of +40 points). - Crafting, Sandboxing, Checking: Scripts now skip tasks if player is in menu mode. Reduces stacks. - Crafting Script: Crafting Tasks are now on a single update loop. Reduces redundancy and stacks. - Followers at home bases will now sleep between 12am and 6am at their default home location. This may not always work at Hearthfire homes, due to bed ownership or lack of available beds. - Follower Alias Script: All object-based Events are now filtered by type. Performance improvement to help prevent papyrus stacking. - Follower Alias Script: All spammable Events are now using busy state bools. While in use, these bools are set to True. Once complete, these bools are set to False. This should drastically reduce papyrus stacking and invalid checks. - Revive from Bleedout now restores 25 health (up from 10). - Taunt Sounds changed to be more unique. Overall sound is less obnoxious. - Taunt is no longer checked unless combat state changes. This removes all update loops during combat. This means that Taunting will not always occur periodically but is less script intensive. - Taunt cooldown reduced to 8 seconds (down from 15). - Healing AI reworked to be more responsive in combat and be more likely to heal other followers. - Healing AI can now heal self and heal other followers outside of combat. Requires using NFF's follow package. - Healing AI cooldown reduced by 1 second. - Follower Follow Package: Tweaked distance responsiveness, followers should travel to the player if out of range, then follow. - Follower Follow Package: Avoidance baked-in for responsiveness. - Follower Sandbox: Followers will not sandbox if one or more followers are moderately injured (this is to allow out of combat healing). - Follower Sandbox: Will more readily sheath weapons (not foolproof). - Follower Sandbox: Sandbox marker now placed 128 units from player (up from 64). To help keep followers from sandboxing on top of the player. - Animal Actors can now be added to bases, show in history and can have Health/Magicka/Stamina boosted. This was originally prevented for actors that do not have a unique actor base, to avoid confusion of seeing generic animals and guards in lists. - Summoned minions will no longer trigger traps. - Followers are now enhanced to more readily check for combat targets when entering combat. If the follower has no target, it will attempt to attack the player's target. If the player has no target, it will attempt to acquire a random hostile target within 1024 units. - Friendly fire now stops its friendly opponent from attacking. - Friendly fire now attempts to reaquire a target for the follower (plus her friendly opponent), same as checking for combat targets, above. - Friendly fire now uses NFF's follower faction instead of checking for player teammate. - Advanced Stealth ranges are now based on follow range. If the follower is following close, she will stealth close. If the follower is following far, she will stealth far. - If using the Command power on an individual follower, you can force them to get behind you by using the Follow/Wait menu and selecting "Behind Me". This teleports the follower directly behind the player. It isn't totally immersive but it doesn't need to make the follower try to get around walls of narrow corridors. - Some coloration added to MCM menu areas to help guide the player visually. - Gold associated follower costs now deposit that gold amount into the follower's inventory in support of mods that utilize follower gold. Try to resist the urge of stealing from your followers. - Serana cannot complete the quest that leads the player to the soul cairn if she is imported. Remove her from the framework while collecting ingredients until after the portal is opened. This is unresolvable without adding a quest condition to multiple AI packages for one point in the game. If the developers would have put her in an actual scene, this would be a non-issue. - Mainly polishing and bug/game issue fixing this time around. - Resolved an issue with the sandboxing package when the current cell has no location defined. - Followers may wander a bit when sandboxing. Its low to give some variety, 256 units. - Tweaked recharge to detect weapon types a follower has in right/left hand. Only recharges if there is a weapon presently equipped. This may also fix an odd weapon duplication bug. - Friendly Fire now works properly again (interaction with sparring addition). Friendly Fire now also prevents followers from leaving the party, if hit in combat by the player. - Followers will now more readily assist the player if they have no combat target. - Slot 10 should now work properly. - Sparring: Sparring followers are now temporarily removed from the CurrentFollowerFaction, if they are in it, and placed back in it when the match is over. This may help player versus follower fights, it may not. - Some option conflicts resolved in the MCM. - Auri (Song of the Green) should now be able to summon her mount. Be sure to turn off horses in Auri's Tweaks page in the MCM. -- Note: In xEdit, Auri's esp modifies "FollowerPackageTemplate", which will change it for ALL followers in the base game. I recommend you remove this entry as base packages should not be changed unless that is the point of the mod. -- There is an outstanding issue where Auri will attempt to ride her mount if it is nearby when sorting slots. Her riding quest is of pretty high priority (80), which causes her to mount often. You'll have to deal with this behavior for now, if I raise quest priority to overtake it, then other mods will break. She is a cool follower though and I have enjoyed fiddling with her. - Animals are automatically set to the "no horse" faction, so shouldn't try to summon a mount. This will be set automatically upon game load. - Tightened up Check Count script to be sure that it only removes invalid followers that are imported. - Check count script will now attempt to restore "isPlayerTeammate" flag if a situation occurred where a sparring match was interrupted and followers could lose this flag. - Teleport should now check z-distance (up and down). - slot int variables depreciated and removed. Now using GetID() directly. - MCM was getting overloaded with options on Interaction and System tabs. Interaction now split into Activity (Sandboxing, Movement, Stealth - new section) and Gameplay (all remaining options). Quest and Dialogue based options from System are now shown on a Quest tab. - Dialogue Followers aliases now directly use the packages that are in the Framework's Package Quest, instead of having aliases in two different quests. Upon game load, followers are removed from Package Quest aliases, if they are not needed. - Follower Package Quest is now only used for imported followers. - If a follower is riding on a mount, the stealth, bump, heal, sandbox and follow packages will be ignored. This will not have any affect on how packages work and simply exists as a "pass though" condition, if needed. - Followers may now enter an advanced stealth mode while the player is sneaking. This essentially makes them nearly undetectable (sound still causes detection). Followers are set to be semi-transparent while in this mode, but you can change the alpha in the MCM (1.0 being solid). - You can now set the chance of receiving a gift from a follower, if using the Regard system. Default is 33% and this is checked daily (more or less - there's an 8-hour difference, randomized). - You can now reset a follower's Regard to its default. The default is 0 for most followers, 4 for Spouses, Housecarls, Children. - PDF guide is very outdated. - Follower AI Quest Priority lowered back to 55. I wasn't thinking clearly on conflicts with other quests by trying to solve other conflicts. - Sandboxing now toggles properly using Command Followers. If it previously was off, it will default to Allow. If it was previously set to Allow & Autobox, then that setting will be stored and toggled to when going from off to on. - Resolved an issue where toggling sandbox wasn't moving the sandbox marker. - Stopping sandboxing now evaluates AI packages. - You can now set sandboxing options in the MCM, even if sandboxing is set to off (so that you can fine-tune it when toggling with Command Followers). - Sandboxing activation/deactivation is now delayed until you exit the MCM menu. - Heal AI (Non-combat) now has a timeout of 3.0 seconds. This is to help prevent AI stuck bugs (happens sometimes with custom packages). - Share the Wealth feature no longer works in city locations. This is mainly to fix an issue where the player would share gold with followers after serving time in jail. - Want to bring your child or spouse on adventures with you? Now you can. "Allow Expendable Recruits" must be toggled on in MCM menu. You will still receive some dialogue options related to child/spouse behavior, which may be best untouched. Never requires a hiring cost. Will not affect spouses or children that can already join you as a follower. -- Recruit/Dismiss dialogue is different for spouse/child. Recrut: "Want to come on an adventure with me?". Dismiss: "I think it's time you for you to go home.". -- Hire cost, if used, is not applied to your children. -- If using Regard, your children start at Rank 4. - Sandboxing/Warp Checks are only started on game load if the player has followers. - Fixed some Start/Stop Sandbox issues related to Warping/Sandboxing in the MCM and in the Count Checking script. - Sandbox Checks will no longer run if no followers are in the party. - Command Followers power will not work if no followers are in the party. - Please note that if it appears that some followers are sandboxing and some are not (and there are not other circumstances, like specific follower settings, etc) it is likely that some followers simply cannot find objects to interact with. The game randomly determines what sandboxing actors will do so it doesn't always matter if there are 3 chairs, a forge and a workbench within reach. - Followers that are with you will not sandbox in a cell that doesn't have a location, if you have Sandbox in Town Only or other specific options applied. This applies more to Home Base locations. When they are dismissed, they will sandbox normally. - Due to some "vanilla style" followers mods enforcing combat styles via quests with combat overrides, priority of NFF AI package quest raised to 100. - Teleport on demand minimum range reduced from 512 to 256. This fixes an issue where a follower could get stuck in a doorway and you are too close to teleport them out. 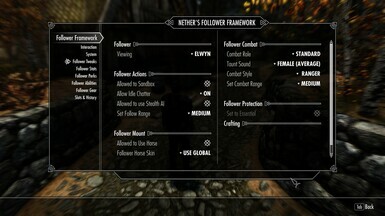 - Fixed Follower Follow dialogue action issue. - Fixed an issue where Sort Slots was setting IsPaying flag to false on follower aliases. - NFF Sparring Quest raised to priority 100. - Followers will no longer cheat in sparring matches involving no weapons. - When sparring, participating followers relationship rank (to the player) is reduced to 0 (Aquaintence). It is restored when the match is over. This should resolve some issues with some followers that refuse to fight other followers. - Sofia will now spar with other followers. She will not spar with the Player as her wardrobe quest stops combat if it involves the player. Why? You tell me. Stopping this quest could cause issues with Sofia, so that's just the way it goes. - Hotkeys no longer function while in the crafting menu. - Some combat error issues resolved (papyrus). - Fixed some issues caused by followers that do not have base outfits when using Adventuring Gear. - If somehow an empty actor is passed to "Remove Follower", it is ignored. This should eliminate messages where a follower is said to be removed but no name shows. Same added to functions for Follower Death, Exporting Imported Followers and Dismissing Guards. - Regard Courage spell and spell effect removed. Instead, the actor's confidence value is boosted, if needed. - IsPlayerTeammate bool and Confidence rating are now stored on the follower alias, so those can be changed and reverted when needed. - If you have removed a follower that had Adventuring Gear stored, any related forms are cleared. - Combat Styles now work properly. -- Follower perk display is now cached. Other sections will follow. -- Reduction of the number of on/off switches (toggles) everywhere by turning options into a menu where it is logical to do so. -- Combat Styles show unique descriptions when switched to. - Share the Wealth, in MCM, is now a menu. Choices are off, on and "on, silent". Silent will not show a message box and automatically distribute wealth randomly, when conditions are met. - Allow Regard, in MCM, is now a menu. Choices are off, on and "on, silent". Silent will not show regard rank increase or bonus messages. - Core System Optimizations to allow the main controller script to run more smoothly with less delay and function stacking. -- Some single-fire actions are now cached. They are sent via a single update (1 second) and then performed. You should notice less delay in dialogue-based actions. This affects dialogue concerning Sparring, Recruit, Dismiss, Import, Export. -- Sandboxing, Teleport and Crafting now run in their own instances using their own quest/script. You should see performance benefits when a lot is going on in game. -- Crafting runs in it's own quest/space as indicated above. -- Crafting no longer uses faction rank switching to handle followers who are crafting or interacting. It now stores that actor temporarily in an alias in main crafting quest. This greatly will reduce issues where a follower might get skipped over during crafting sequences. -- Crafting/Interaction now randomizes the follower list (for crafting order) by adapting the Fisher-Yates shuffle algorithm. -- Crafting is now able to handle different tasks simulataneously (one follower making a torch while another sharpens their weapons). -- Crafting re-scans the area periodically even if the player isn't moving or auto box is being used. -- Crafting makes better attempt to find objects near the follower. -- If going into crafting mode, a follower will now walk if close to the crafting station and run to it only if they are far away. -- Tavern Drinking - Followers now do a "give idle" after receiving a drink from a server. -- Tavern Scene redesigned to perform better and with less issues/hangs. -- Tavern - Followers will no longer order drinks in temples, lol. -- Tavern - wenches/servers are now looked for in multi-level buildings. -- Drunk effect is no longer a magic effect and is handled on the follower's alias. It should no longer fail to exit a drunk idle. - Follower teleport will now summon a follower who is in a running scene. - Skyhaven Temple recruitment should now work properly (reworked system). -- QF_FreeformSkyHavenTempleA_000E38C9 no longer needed and not included in FOMOD Blades Options. If manually installing, remove this file (otherwise you can receive duplicate blades outfits). -- As above, BladesChangeOutfitScript no longer needed in Core installation. - Sort Slots now handles animal followers properly. - Animals should be able to properly use the Regard system. They can also give gifts (i.e. they dug it up... why not). - Restructured 3rd Party mod detection. - Corrected an issue where the 4th slot might not have been correctly storing armor pieces when using Set Follower Gear. A slightly different method of handling armor is now in place. - Followers can now Craft Potions. Similar to other crafting. Followers will only craft health potions of the appropriate level and only if within an Alchemy station. Cooldown is 8 hours in-game. - Followers can now Craft steel Bolts instead of Arrows (you cannot craft both on the same follower). - If using Hearthfires, you can now dismiss a Steward. This is done by grabbing the necessary faction using GetFormFromFile and storing it. It does not change or alter any Hearthfires quests or dialogue. - You can now cause your horse to appear behind you, out of camera, instead of in front of you, when using Call Horse hotkey. - Increased Player hits on allies/friends in some circumstances. -- A single hit outside of combat on a Follower no longer dismisses them, they must be hostile to the player first. -- Hits on Friends in Combat raised from 4 to 15 (Game setting: iFriendHitCombatAllowed) - this was done long ago, just being notated here. -- Hits on Friends in Non-Combat raised from 0 to 5 (Game setting: iFriendHitNonCombatAllowed). -- Hits on Allies in Non-Combat raised from 3 to 5 (Game setting: iAllyHitNonCombatAllowed). - You can now adjust the avoidance distance (from the player) while followers are sandboxing. The default is 120 units. Lower this if followers are avoiding you too often when you approach them. - Along with Sort Slots, there is an option to "Flush Slots" in the slots page. This will dismiss/export all followers and then force all framework slots to be cleared. Using "Dismiss All" with the command ability will also perform a flush. -- This is a beta, beta feature. It generally works well but can be head-scratching when it fails. Feel free to report issues concerning it but do not act surprised if something is odd. I really like it for testing the strength of followers against each other or testing NFF's combat styles or even seeing how well you fare against your followers. -- Dialogue is activated under System in the MCM. -- You can spar with your follower, either unarmed or free-for-all (weapons, spells, etc). -- Some imported followers will not spar. Serana will. Mrissi and Sofia will not (for example). They are using some means to halt friendly fire that I'm not able to yet figure out. -- You can cause two followers to spar each other. -- Does not use the vanilla brawl system or touches it. Uses some concepts/code by Enai Siaion from Modern Brawl Fix (permission granted on mod page). -- This is great for gauging follower strength against you or against another follower. -- If you win a match, it does add to Brawls won. -- If you sheath your weapon, you forfeit and the fight is stopped. -- If you are doing an unarmed fight and you cheat (spell, weapon, etc), you forfeit and the match is stopped. -- Give yourself room to spar. If you accidentally hit a bystander, the match is stopped. - You can stop a fight by drawing your weapon and then sheathing it. If your weapon is already drawn at the start, simply sheath it. - Sparring will grab up to 3 bystanders and 3 of your followers to potentially make comments and watch the fight. -- With any issues with the brawl, like imported followers refusing to fight or a weapon glitch, if you draw and sheath your own weapon, a forfeit will occur. -- There may be a bug where bleedout on the player will cause heartbeat sound or screen visuals when hurt to keep playing. Fast traveling may fix this. Injuring yourself seems to fix this (I've tried to heal then injure the player in the script to help fix it). -- I am still smoothing out certain conditions, such as the player hitting a bystander or a guard and then everyone goes batshit. Try to keep distance from bystanders. - Sparring should stop all crafting and tavern interaction. - Serana and Sofia should no longer get randomly removed from the framework. - Toggles for Spell Learning (Book or Casted) should now switch properly. - Hire Steward Hearthfires function should be fixed. - String issues should be fixed in the MCM. - MCM Abilities tab now shows spells with a cast time of under 1.0. Note: Temporary spells from other mods may also show up in this section. - Dependencies removed from Skyhaven Temple Quests. - FOMOD Installer now installs sound files. - FOMOD Installer now has the option to install Vanilla Skyhaven Temple support. If you are using "Skyhaven Temple Restored and Expanded" make sure this option is DISABLED. If you are not using this mod, ENABLE this option. You will NOT get the option to make Blades outfits optional if the aforementioned mod is installed. This mod has not been fully tested by me. - Skill Affinity now detects if a follower is wearing a piece of light or heavy armor when potentially awarding a skill point to the player. - Command, Dismiss All, now informs you that followers are being dismissed. - Follower Bases: Moving a Home, Work or Relax location now clears it's old name. - Follower Bases: Relax Location now works properly. - Share the Wealth is ignored when no followers are with you. - Confirm Import/Export feature added. If enabled, a message box will prompt you when importing or exporting a follower. The intent is to block accidentally hitting Import/Export. - Set Adventure Gear tweaked. -- Gear items are no longer missed and should be consistently stored and applied. -- When you set adventuring gear, an attempt is made to only remove their outfit, instead of removing everything. "Undress when Equipping" in the MCM menu will continue to clear out most of the followers equipment slots, if the tweak causes an issue with some followers. It is more efficient to try without it, first. -- "Undress when Equipping" can now be toggled even if a Gear set has not yet been created. -- Gear may stick more consistently when changing cells, as UnequipItem has been changed to UnequipItemEx (SKSE). This affects unequipping a follower's base outfit. - Follower Horses feature tweaked and redesigned in some areas. -- Followers are no longer given ranks in the nwsFF_HorseFaction faction. Instead, their horse is matched according to their slot position (Alias ID's are identical). -- nwsFF_HorseFaction is depreciated and no longer used. -- nwsFF_NoHorseFac is a new faction that stores whether or not you've allowed a follower to use a horse. Since this is new, you will have to tweak followers again if you don't want specific ones to use a horse provided by NFF. -- Followers will no longer randomly not have a horse to ride. -- If Follower Horses are set to stay around and the player fast travels (or is otherwise at far distance from the horses) and mounts, follower horses are teleported to you. -- A follower's horse will disappear when they are dismissed, even if they are set to stay around (there is a finite number of horses). -- Follower dismounting and disabling is now handled on the follower alias script, speeding up the process. -- Horses no longer fade in and out when Enabled/Disabled. This is more abrupt but processes faster. -- Horse Effects, if used, are re-applied more consistently. -- Horse Effect appearances tweaked/redesigned. -- In MCM, changing mount style will force update of horses when the menu is closed. -- In MCM, disabling follower from using a horse, will remove that horse if keep horses is set. - Using Extinguishing Torches on a follower with a hidden helm will cause the helm to appear for a moment, when they exit a crouching state. - Follower Packages Quest Priority lowered to 55 (from 90). This should restore compatibility with most mods that rely on package stacks. - Serana now uses her own Packages Quest when imported (Priority 81). Required as she uses packages across multiple quests for her functionality. - Package Quest Force/Clear re-written. - Hired (Expendable) Followers will now use Packages Quest (bug). - Toggling "Teach Spells" or "Learn Spells from Books" now refreshes the tab. - Followers can be set to use their own default "follow" package, mainly for imported followers. If used on a regular follower, they will use the vanilla follower player package. Enabling this feature (under Follower Tweaks) will not allow you to set a following range, as it skips this package. - Under the System tab, added a Debugging section. You can attempt to reset an imported follower here. Affects a target under the crosshair. Can be used even if the NPC is not in the party. Try not to use this on non-imported followers. - The option to hide Import/Export dialogue has been reverted and removed for now. May be changed to a Yes/No dialogue warning box in the future, with the option to show that box or not. - Completely reworked MCM menu on the back end due to "State" limitations. Now using version 1 of the MCM API. - "Stop Gear Managment" is now a "button" instead of a checkbox. - Added "Click Here" text for items that function as buttons, where logical to do so. - Hearthfires fix to hiring Steward (BYOHHouseBuildingScript). - Animal followers no longer summon horses. - Horses no longer disappear if you've set them to stay around. - Expendable Recruits now properly clear factions and other values upon death. - Animal followers mods that attempt to automatically add animals as party members will no longer evoke the message that they are already a follower. This is most likely due to a script attached to the actor that always runs "onActivate" (which means any time you interact with the animal). - Sort Follower Slots now properly clears or moves variables from one slot to another (it did some but not all, before). - Follower package stack is evaluated when entering a new cell. - Sneak distance from the player is now increased. - Horse riding distance from the player is now increased. - "Explosion" radius for Taunt set to 0.0. Should no longer knock over havok objects. - You are now notified when the framework is fully loaded, including background tasks. This happens upon initial installation or loading a save file. Can be turned off. - Import/Export can now be hidden from dialogues. - All followers now use the Package Quest aliases for handling AI. Previously it was only used by imported followers. This splits the larger follower AI package into smaller packages and runs them at a higher priority. - Main scripts restructured and optimized. - Imported followers can now be given Combat Roles (Tank, Healer). This will override the combat package that comes with them. For example, if you make Sofia a spellsword using her MCM function and you also make her a Healer using NFF, she will not be a spellsword (as defined by Sofia's mod). If you want them to use their original combat package, leave set to Standard. - Saving Settings reminds you to also save your game, required to generate the actual save file. - "OnUpdateGameTime" function on the follower aliases is now designed to perform a single update in one-hour intervals. This only occurs if a follower is waiting (vanilla style), is hired (paid a daily rate) or has the sharpened weapons buff. It's also in place for future features. - Crafting cooldowns system reworked (yes, again). It has been changed to tracking directly on the alias instead of fire-and-forget spells. Reason is that spell effects are removed when entering a new cell and I was under the incorrect assumption that they lasted their duration (silly me for thinking duration actually means duration). If you dismiss and then recruit a follower who might have recently crafted, their startup crafting times will be delayed by a random amount of time. - Crafting order (of followers) is randomized. - Followers now only craft torches if they have less than 3 (instead of 3 or less). Goes hand in hand with "Follower Torches Expire" in new features. - Interaction in the Tavern had the same duration issues and has been fixed. However, becoming "drunk" is handled more realistically. A follower can safely drink 1 drink per hour and not be drunk. If they drink more than that, then there is a chance, influenced by the number of drinks over the hourly limit (similar to real life... immersion!). Followers will neutralize one drink per hour (all in game time, so 3 minutes real time). - Followers that are in a waiting state will no longer craft or interact in taverns. - Waiting followers can not longer be summoned via Command Followers (bug). You can still summon them via History, if you wish. - Expel Follower option now removes guards and exports imported followers. - Dismiss and Dismiss All menu functions now export imported followers. Same with divorce (as unlikely as that might be). - Tavern Interactions - Support for non-conventional inn locations (Drunken Huntsman), support for Immersive Wenches. Eligible NPCs that can be interacted with must still have suitable vanilla voice and be in the innkeeper, innserver or job faction. There could be false positives. - Wording of "sandbox" when toggling sandbox changed to "relax". - There is now a function in place for detecting (problematic) advanced followers. Sofia and Serana are directly supported at this time. This does not mean that other advanced followers cannot be used, just that this is "official" support because I've spent time using them and can work out any quirks. - Sofia's esp is detected if installed. Her actor reference is added to a special alias that is used to get her to work correctly when importing. When you interact (talk) with her, her party status is detected, allowing proper import/export. If import or export does not show up and she's been recruited by you, wait a moment and talk to her again. Most of the time there shouldn't be a delay, but it can happen. - Fixed an issue where imported followers could be dimissed when using the command ability to make all followers wait, if you used their "follow me" dialogue afterwards. - Serana and Frea have voiced dialogue when in tavern interactions, Share the Wealth and Regard gift-giving. Frea is detected without a dependency. Sofia does not have voiced dialogue in these instances as I need permission from the author to utilize the voices files and it has not been granted. - When applying Adventuring Gear, you can force a follower to remove all of their old gear first. This may be useful if a follower is using an outfit with "leveled items" used to generate it as those items may not be properly detected. Keep in mind that it will remove everything they are wearing and ONLY equip items dictated specifically in their list of Adventuring Gear. This is found on the Gear tab as "Undress when Equipping". Set on a per-follower basis. - Followers can be set to extinquish their torches when the player is stealthing. Behind the scenes, this removes all torches from their inventories when stealthed and restores them when the player comes out of stealth. This is a global, all or nothing, setting found under Actions in the Interaction tab. - "Follower Torches Expire" - I made an assumption when allowing followers to craft torches. I thought that, like the player, those torches expire when being used. They do not... Which doesn't make a lot of sense of followers crafting them. So, followers torches can now be set to expire. Follower torches last one hour of game time (3 minutes). This is a minute less than regular torches but it lines up well with the cooldown system. Also, if a follower unequips then equips a torch before the 3 minutes, the torch will be reset (just like how torches work on Players, if you didn't know this). Followers tend to change their held items quite often, so this shouldn't be an issue. - "Weekly Follower Cost" - You can set a Weekly Follower Cost for any followers you recruit. This is the value, per week, in gold that you need to pay each follower in order to retain them. Setting or changing this value ONLY affects new recruits so if you want to apply a cost to existing followers (or change their current rate), you need to dismiss them then re-recruit them. If applied to "hirelings" as defined in NFF, you will no longer be able to re-recruit them for free. Retainer cost is never applied to housecarls or your spouse as I don't feel it really make sense. You can check the current rate for any individual follower by checking their Stats tab, near the bottom. When applied to a non-imported follower, and you don't have the gold to pay them, every hour (game time) there is a chance they will leave you. For imported followers, they cannot be set to force-leave you, as it behind the grasp of this mod to do that. However, they can leave the framework (deciding to no longer follow your rules, so to speak). In either case, the player must have the gold ON THEM, not stored in a container somewhere. If you wind up with the gold, you can enter into a dialogue with them in order to pay them. If you dismiss them early (less than a week) you will have to pay them a partial amount. - "Share the Wealth" feature allows you share big hauls of gold with your followers. This is another "gold sink" but does give them a morale boost for a short time, granting some bonus health. This occurs randomly, distributing half the gold from looted containers or dead bodies to your followers. You can change the minimum amount to share in the MCM menu. - Regard system implemented ("Allow Regard"). This is sort of a relationship system in that it determines the bond that develops between you and your followers as you adventure and fight alongside of them. It is somewhat simple at this time but may be expanded in the future. It is more of a roleplay feature but has some benefits at certain ranks. Regard has no affect or influence from your game relationship to them. For one, the relationship system for followers is often inflated, making them instantly allies or lovers. For two, even if you are friends with someone and you see them in town from time to time, it can be a different story entirely to spend time with them "on the road". There's also no influence if followers have been with you for a while prior to implementing this feature, everyone starts at ground zero (couple of exceptions, below). You can disable regard for a follower if you wish (or not use the feature at all, it's optional). Regard starts higher for spouses (rank 4) and for housecarls (rank 3). There are 10 Regard ranks, from 0 to 9 (Indifferent to Reverent). You can check a follower's Regard at any time on the Stats tab. At this time, Regard cannot decrease, nor can be custom-tailored to a follower's morality. When a follower is with you, their Regard rank is converted to a larger pool of points (rank x 100) to allow events and happenings in game to increase their points and thus, their Regard rank. When a follower is dismissed, their points are converted to a new Regard rank. When going from points to rank, fractional values are lost, so when dismissing a follower, it's best to do it after they have recently gone up in rank (you are notified of this). For example, a follower with a Regard rank of 4 needs 500 points to get to rank 5. If you are at 478 points and dismiss them, they are still at rank 4. Regardless of this limitation, points are fairly easy to obtain. The following events grant Regard points at this time: Generally spending time with you (minor increase, calculated every 6 hours), fighting alongside you (per combat "event", minor increase), paying them a salary (moderate increase on a weekly basis), sharing wealth with them via Share the Wealth feature (moderate increase). All points have randomness to them. When a follower goes up in a rank, you are notified with a simple message. At Rank of Trustworthy (3), a follower will occasionally give you gifts. These will be crafting materials and can be ingots, leather or gems. It is assumed that they shopped for you while out of sight or have collected things from time to time. At Rank of Faithful (6), the follower will no longer be affected by spells and abilities that would cause them to flee. At Rank of Reverent (9), your follower will hold you in the highest regard and be given an Inspired buff. This boosts their Health and Stamina by 25 and makes them more effective when using Destruction, Archery, One-Handed and Two-Handed (+10 skill). You can turn off any of these granted abilities (for all followers) in the MCM. - "Call Player Horse" - You can set a hotkey that will call the last ridden horse to you. When pressed, you will whistle and if at a great distance, the horse will be teleported to you. Once the horse is in your vicinity, it will walk to you. - Missing Stray Dog script added. - Missing Have Drink script added. - MCM should support all non-english versions of Skyrim (though it will appear in English). Covers Czech, French, German, Italian, Japanese, Polish, Russian and Spanish. - You can now choose the Sandbox radius (1024, 2048, 4096) in the MCM. Larger radius will allow followers to move around and interact more freely, smaller radius will keep them closer nearby. - Sandbox marker now updates its position as the player moves. This is done in blocks of 512 units (the marker will move to the player every 512 units he moves). This has a subtle effect of followers gradually moving to where the player is located as he moves around (if they are still sandboxing). - If able to craft arrows, the formula for the number created has been updated. Followers with higher Archery should make more. - Last picked follower now remembered when closing the MCM menu. - Crafting/Interaction cooldown design has changed. Instead of tracking it according to the followers you currently have, a magic effect is applied to that follower as a cooldown. This eliminates the issue of followers resetting their crafting/interaction when dismissed and re-recruited. This should work indentical as before for crafting, just the mechanism for tracking time has changed. For interaction with wenches, the cooldown is a fixed 15 minutes of game time (90 seconds real time) with a 25% chance they will fetch a drink if their cooldown is over. This should be more efficient will less design issues for future crafting/interaction implementation. - Affinity check values now move correctly when sorting followers. - Reduced weapon charge time slightly, if you have enabled followers to recharge magic weapons. Was a little too spammy after last optimization. - Attempt made to streamline the summoned horses feature and possibly have less chance of ctd/freeze for those that are experiencing it (I have not been able to reproduce the ctd here). Horse-based packages no longer fire off any scripts and it's all done on the animation events. Animation events moved to the main controller script (off of the player alias), they are fire and forget events. Tightened up horse summoning code and disable code. Fixed "ghost" effect so it looks ghostly. Horse actors are "cached" if possible to speed up the summoning function. - "Sandbox_Radius" and "Sandbox_Range" are now saved/loaded in configuration. - Note on Sandboxing: If you want it closer to the "old way", as in pre-2.1.8, in the MCM set "Relax Radius" to 1024, "Relax Ramp-up" to 0. Remember that you can check "Only Sandbox in Town", if you don't want followers to sandbox in dungeons, out on the open road, etc. - Home Bases feature should now work properly. - Attempted fix to Calm Followers power. No longer applies "calm" archetype, just stops combat for affected targets. - Recommended: Go to a new cell. Sort follower slots. Wait one hour, in-game. Save and reload your game. - Agression for actor can only be set to Aggressive or Unaggressive to prevent issues with neutral NPCs. - Stray dogs no longer are able to automatically join the party. Instead, when you talk to a stray dog, you will get optional dialogue to recruit them. This fix essentially neuters the WEDogFollowerScript. - Hiring dialogue now checks to make sure the player has enough gold. - Framework no longer affects fBumpReactionSmallDelayTime for compatibility with other mods that affect this value (was set to 0.5, now is at default of 1.0 if unmodded). - Noticeably increased gather distance if player is stealthing and Stealth AI is enabled (from 128 to 160 minimum). - Greatly increased sandboxing radius (from 1024 to 2048). Removed ability to wander outside sandbox radius (package tweak). - Followers no longer run to you when they are out of sandbox range (package tweak). - Followers now sandbox around the player instead of themselves, so will gradually move to your location when sandboxing. - Rebuilt sandbox routine to be more efficient and include crafting checks. If using basic sandboxing, then there is a ramp-up time when the player is sprinting/running before followers stop sandboxing (3 seconds by default, can be set in MCM). - Sandboxing is stopped/reset when entering a new location. Crafting/Interaction quests are stopped as well. - Improved combat awareness. Followers now react more logically to new enemies/enemy detection (package tweak). - Rewritten PDF guide with specific impact and changes noted for each feature. - Teach Followers Spells - You can now elect to teach followers spells you have equipped instead of trading books to them. It appears on the menu when using the command power on a follower. Must be enabled in the MCM. - Home Base Creation and Management - Really too much to go into in depth here, it's all in the PDF guide. Basically, you can set up 10 home bases and for each base define a home location and optionally a work and relax location. You can name your bases and rename the locations displayed. You can travel at will to your bases. You can easily shift followers from one base to another. Do not use simultaneously with MHIYH (on the same follower), choose one or the other for that follower. Has it's own section in the MCM. - Skill Affinity - Similar in concept to AFT's "Synergy" but designed differently. This allows you to learn some combat-related skills from your followers when you fight alongside them with the idea that they are taking from the ability to allow you to skill up by dispatching enemies and getting hits in before you do. There's more depth in the PDF guide on this, but every so many "fights", a follower's skills are checked against the player's to see if you learned anything from them, granting you an small skill increase. What an npc has done in combat, skill weights (how high they skills are) and random chance comes into play here. As far as combat actions go, it's just a very quick and basic glimpse of what the follower has equipped and assumed to have been using, not monitoring all their attacks and actions, so it isn't flawless. If a follower has a much higher skill than yours, it's more likely that you learn something from them. However, there's always a base chance that you'll learn something as even a master can learn from a student. Affinity should be quicker when you are at low levels and have lower skill and slower when you are at higher level with better skill. - Object Awareness - Upon sandboxing, the framework will detect if suitable furniture items are nearby (Forge, Anvil, etc) and if so, followers can be set up to interact with them for interaction or immersion purposes (starting other quests/scenes). This will be expanded in the future. Requires sandboxing to be enabled in NFF. - Crafting - Hand in hand with Object Awareness, when in sandbox mode, followers can craft various items if within range of certain furniture items. Currently, they can craft Torches, Arrows and Sharpen their weapons. Object creation has 8 hour cooldown, sharpen has 6 hour cooldown. This is a convenience function and they do not expend materials, it is assumed they have acquired them along the way. Crafting is stopped when the player changes locations. Followers will not craft in dungeon locations. - Interaction - Can interact in taverns and order drinks. This is a flavor thing and has no significant buff or gameplay changes. They can get drunk if they have already been drinking. Occurs randomly in taverns, up to an hour between drinks. Supports male child, argonian male, female nord, female shrill and female sultry voiced innkeepers and servers. Supports Immersive Wenches and mods that add npcs if they use those voices. Notifications and drunk option can be turned off in MCM. Interaction is stopped when the player changes locations. - You can now turn off the Protected flag for followers. If this flag is off, followers can be killed by you and will not enter bleedout, they will die. However, most followers in the game and downloaded are Essential, so this will make no difference at all. Only expendable followers (soldiers, guards, etc) will be affected and mods that specifically provide non-essential followers. You can also modify followers on your own to be non-essential using the CK or xEdit but that is squarely on you, along with any ramifications for doing so. - Move Proximity - you can now control the distance at which followers are too close to you and move out of your way (flee). The default value is 12 units but can be changed in the MCM under System, Movement. This is to help with some issues with some mods and for VR users (though I'm not explicitly recommending VR because I cannot test it). - Damage Multiplier - You can now change the base damage a follower inflicts (lower or higher). Under follower tweaks in the MCM. Permanent change to that actor, even if they are not with you. - Just want to note here that Sandboxing will feel a little different. As mentioned in fixes, there is a ramp-up time concerning movement, it isn't automatically detected, thus making entering/leaving sandboxing less jerky. It is 3 seconds by default which means that once followers are sandboxing, you must be sprinting/running for 3 seconds for that to be a valid condition for stopping the sandboxing. Drawing your weapon, crouching, etc will continue to stop sandboxing as normal (unless you have auto-boxing on, of course). You can adjust the Ramp Up time in the MCM. - Fixed an issue in MCM where you couldn't change Sandbox Relaxing Time. - Fixed an issue in MCM where Global Horse Skin shows an erroneous value. - If a follower is designed to be essential, essential will be displayed as checked in the MCM. - Conditional variables are now reset when dismissing (or exporting) a follower or sorting slots. More of an optimization than a fix. - Stray Dog script now sends directly to the NFF's controller script. - The framework now tries to detect if it has a position in your load order that is causing a problem with slots (aliases). If less than 10 slots are detected as being available, the mod will warn you and ask you to exit the game and correct the issue. - If Weapon Recharged Notification is enabled, the name of the weapon is displayed when a follower recharges it. - If Weapon Recharged Notification is enabled, the name of the gem is displayed if a follower uses one. - When in the Healing Role (set in MCM) and a follower heals a party member (or the player), bonus healing is granted based on their Restoration skill. It's around 25% of their skill as bonus healing, so a follower with 60 restoration would heal an additional 15 points (90 total). - Calm Followers power now has a dual function. If used during fighting, it will work as normal: followers are calmed. However, it can now be used outside of combat to fix any follower that is having an animation glitch (running in place, constantly blocking, turning in different directions, etc). Outside of combat it will cause a brief stagger that is not harmful, which should fix these glitches. - Command Followers will more accurately detect a follower who is under the crosshair (otherwise it attempts to detect by hitting the follower with an invisible, harmless projectile). - When checking an outfit (upon game load, entering a new cell, etc), instead of re-loading all armor pieces, the function now checks only against that actor's base outfit and unequips any of those outfit items that are visible. This is far more efficient with less stutter from reloading 3D and without seeing multiple pieces appear and disappear. - Stored Adventure Gear slots are now increased from 15 to 25. - Command Followers and Calm Followers can now can be keymapped in the MCM. The player does not need to have the actual abilities to use them if they are hotkeyed. - Command Followers ability can now be removed from the player (for use with hotkey only, above). - Calm Followers visual has been changed. Old visual + imagespace does not work properly when keymapped. - Followers can now be set to automatically unequip their quiver (removing arrows/bolts from their back) if they are not using a ranged weapon. It supports all vanilla arrows but can learn to affect arrows/bolts from mods or DLC if you trade those items with a follower who has this feature enabled (you will have to re-trade with them one-time if they already have mod/DLC ammo prior to this feature being added OR they come with special ammo already). This is found under the new "Follower Gear" tab in the MCM. -- As requested there are several vanilla NPCs who can now become companions. Some have quest-based requirements to avoid game issues. -- You can toggle them on in the MCM. As long as you haven't completed their requirement, you can also toggle them off. -- If you toggle them on and have not yet completed their requirement, once you do and you enter a new location, they will be enabled (uses Change Location event). -- If you have already completed their requirement, they should be ready to go immediately. -- You can recruit and marry Saadia once you have completed the quest "In My Time of Need". -- You can recruit Ysolda when you have completed the radiant quest to bring her a mammoth tusk. -- You can recruit and marry Colette, Drevis, Faralda, Nirya, Phinis, Sergius and Tolfdir when you have become the Archmage of Winterhold. This also requires RDO to be fully functional. Without RDO, only Drevis and Faralda will have the required recruit dialogue. Sergius and Tolfdir will require it if you want to marry them. -- You can recruit and marry several Thieves Guild members if you have defeated Mercer. - Under Stats, you can now boost Health, Magicka and/or Stamina if it is low for that follower. This is intended to boost them so that you can teach them spells or make a weak follower able to take more damage in combat (and so on). -- This is limited to a flat one-time bonus, which is up to 175 for Health and Magicka, 100 for Stamina. If the followers Health/Magicka is lower than 175 or Stamina is lower than 100, their stats will be raised by the difference. -- This isn't perfect because scripting doesn't have access to the Actor's offset in Health, Magicka or Stamina nor does it have access to the stat weights from class, which are multipliers per level. This means that even if you boost a follower this way, if they aren't intended as a mage or warrior via their class, they will eventually lag behind. - Under Stats, Health, Magicka and Stamina stats now display total value (in parenthesis) and current value. - Restructuring of the MCM Interface. This is an ongoing process and has two goals. 1) Better balancing of empty space. 2) Less overwhelming when new features are added (and less overwhelming period for new users). This will hopefully make more sense when you view the menu, but the changes are outlined below. -- History has been moved to the Slots tab and that tab is now called "Slots & History". -- Unused (empty) slots are now shown greyed-out (disabled). -- New tab, "Follower Gear" has been added after Follower Abilities. Headwear and shield equipping options are moved here, under Equipping Actions. The ability to copy the followers base outfit was moved here under Base Outfit. Adventuring gear storage and list has been moved here. This area will have more use in the future. -- Reorganized space under Follower Tweaks with the clump of tweaks under some different headers for ease of finding things. - Restructured English Interface strings file. - The FOMOD Installer now detects 3DNPC and RDO and recommends the appropriate options automatically. - Installer now has the option to install the leveling BAT file. - When imported, the framework now checks Serana's "IsDismissed" flag in regards to removing invalid imported followers. This should help allieviate some issues, such as interactions with Convenient Horses. - Streamlined additional follower alias code. - When setting headwear off or only in combat in the MCM for one or more followers, they are checked upon menu exit. - If a follower has on headwear when setting it to be used only in combat in the MCM, it should be recorded immediately. - If headwear is part of a follower's adventuring gear and has been stored AND you have their helm to only show in combat, it should be registered automatically when re-recruiting them. - "OnObjectUnequipped" event has been removed from follower alias code. - Removed debug message of who gets taunted. - Expendable Followers dialogue is disabled by default. - Dragonborn DLC: Fix for quest script (DLC2_QF_DLC2MQ04_020179DE), if Frea is in the party. - Hearthfires DLC: Fix for quest script if a follower is turned into a steward (BYOHHouseBuildingScript). - Dawnguard DLC: Fix for a possible radiant quest that can involve your spouse, if they are a follower. - You can now set thresholds for healing for followers in the healer role, in the MCM menu. The base percent is 65%, meaning that if a target is under 65% health, conditions will be favorable for the healer to heal them. This is somewhat high to adjust for combat reaction time and you should make the same consideration when adjusting values. You can adjust this separately for the player, the follower and for other followers in the party (including temporary teammates). Raising this value will cause a healer to heal a target more often, on less health loss. Lowering this will have the reverse effect. - Perk Display: A new perk tab has been added for followers. This will show nearly all the perks available, categorized by the type of skill they belong to. Multiple ranks of perks will show with tier and a number in parenthesis. In the case of perk overhauls, it natively supports vanilla and Ordinator perks. Other overhauls will still display information but may show different tiers as duplicates of the base perk (instead of Armsman (Tier 1), Armsman (Tier 2), you may would see Armsman, Armsman, for example). It may take a second or two to display perks since it has to be implemented manually. -- Magicka costs are now displayed next to each spell. This cost is relative to the follower being viewed, taking cost reductions from Perks and other abilities into effect. -- Granted abilities should no longer show effects that come from perks. Basically any "spell" that has a cost, duration and area of 0 is not displayed. - There are still outstanding interaction issues between NFF and CH, unless you turn horse support off in NFF that I cannot yet replicate in my own game. Just a heads up. Serana being dismissed should be fixed though. - When your game first loads, this mod's startup functions are delayed for a second or two. Going into game menus during this time may interrupt some functions, so just wait a moment or two. I'm looking into streamlining this in the future. When loading into a new cell, it may take a second or so to update your follower's gear and this may take a few seconds with a lot of followers who have lots of gear pieces. - Disable Bleedout Recovery should work properly. Toggle off to allow your followers to recover from bleedout during combat after a short while. Toggle on to keep your followers from recovering during bleedout. They may stay down for quite a while if you have it enabled. - Fix for CTD when Taunting, hopefully. See changes. - Speed Boost is off by default for new games to resolve issues with Requiem or other mods that provide speed boost. - Calm Followers spell no longer applies a light force effect, which could be sensitive to other mods. - Ranger combat style now allows dual wielding (more like pen and paper ranger). Versus Berserker, the ranger is less offensive and circles/retreats less. Berserker is much more in your face. - Priest combat style increases chance of staff use, slightly. -- Close follow distance is a bit further out. -- Range of bump, where followers move out of your way is increased slightly. -- Bump range is greatly increased when followers are sandboxing. - Optimized several follower features. Learn Spell, Mount/Dismount, Recharge Weapons and Taunt now run directly on the Alias script instead of the Controller script. These features will work more smoothly, quickly and independently per follower. This will also improve performance overall slightly. - The application of adventuring gear is done more efficiently. Furthermore, if you don't have gloves/gauntlets, headwear or boots/shoes as part of a follower's gear, the system will attempt to unequip those pieces. This relies on keywords and slots and some modded armor may be using the wrong keywords for the wrong slot (for example, ArmorGauntlets keyword on shoulder parts). Though an It is beyond the scope of this mod to fix bad keywords on armor mods but you can easily do this via xEdit or Creation Kit. - Follower Alias script performance should be better overall. - Tank Taunt has been optimized. Conditions for checking for a taunt now reduce false positives and possible cases of CTD. Line of Sight condition has been added to reduce some stress/false positives. This will fail to taunt opponents that are not in the follower's sight or behind a wall but is a tradeoff for stability. - You can now choose between 6 different Taunt effect voices. There is higher and lower pitched male and female. This setting is saved to a follower and doesn't need to be reapplied unless you change your mind. - In the MCM, Resistances have been moved to the (new) Abilities page. - General overall cleanup of main script. - Follower History feature. The last 25 (unique) adventurers that were with the player are now recorded. Via the MCM you can see where each is currently located and fast travel to them, if you wish. You can also elect to port them to you. You can set the history length (number remembered) from 0 to 50. There is slight impact (a second or two) when loading a new game as history is checked (for dead or invalid actors), lessened the lower the history length is. 25 is probably a good balance for most people, higher for follower fiends. 0 will turn the feature off. Only followers that have been with you from this point onward are recorded. - Divorce Feature. Though this might be somewhat outside of a follower framework (but maybe not since there are lots of followers with a marriage option), you now have the option of divorcing your spouse. You can enable this feature in the MCM and how a brief conversation with your mate. If you decide on divorce, they will be angry for a little while (4 hours game time) and will brush you off if you try to interact with them. If your spouse is your follower, they will leave your service. It is unlikely to work properly if you are using a marriage mod that allows for multiple spouses. - Potion Recovery feature. In much the same way that you can Stimpak a downed ally in Fallout 4, you can now use a potion on a downed follower (bleeding out state). You can choose to use logic in which potions are used (strongest to weakest or vice versa) or simply pick one potion to use on them. To use, interact with your follower while they are downed and if available you will use a potion on them and they will be taken out of the bleedout state, ready to resume fighting. Only supports health recovery potions available in the vanilla game. This feature runs independently on the alias script, per follower, so should be efficient. - Revive After Combat. This goes hand-in-hand with the Disable Bleedout Recovery feature of the framework. If a follower is still in a downed state after the player is out of combat, this will attempt to recover them to an unwounded state. - You can now examine the spells and abilities of a follower. It is split into Base (those that the base actor starts with) and Granted (those which are applied via effects or have been learned from a spellbook). It is not perfect and will show any spells that are applied to a follower via other mods, such as spells granted by perks, perk overhauls and temporary effects). Perks themselves are not listed here until I can figure out an elegant way to implement this (other than creating arrays of hundreds of items to check against, which is likely slow). The main reason for adding this is to help track what spells you teach your followers. - Increased the delay slightly when checking a follower's gear and so on. This is mainly to help with interference when auto-saving or loading a cell. 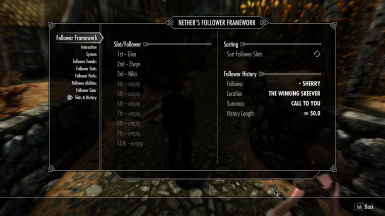 - Optimized re-applying framework settings on followers upon game load. - Incompatibilities resolved for some other follower mods and possible fix for some followers, in general. The vanilla DialogueFollowerScript has been changed to reference the framework using "GetFormFromFile" for compatibility with followers that use their own quest but have attached this script. - If you are using Interesting NPCS, the structure of the replacement follower3dnpc script has been tweaked. - Fixed a couple of instances where messages where using a follower's true name instead of their nickname, if in use. - Taunt tweaked for those followers in the framework Tank role. Taunt cost reduced from 20 to 15 stamina and is cast for free at the start of combat. This should help tanking followers that often make use of power attacks, particularly for 2-handed fighting. - Nickname feature has been removed. SetDisplayName can cause game issues such as making you unable to interact with renamed actors or game corruption. If you used this feature before, please try to go back to an earlier save where you didn't rename any followers. I had no idea of the level of damage this could cause and it was added to better allow you to customize your follower experience. - You can now set Aggression, Assistance, Confidence and Morality for Followers. This is only enforced while they are in your service. These values are recorded in factions specific to the framework so that they can be re-applied when you re-recruit them. - You can now apply Combat Styles to followers. There are 10 styles available and you can always set your follower back to the style their started with. There are 4 magic styles, 3 melee styles and 2 ranged styles. Keep in mind that these styles affect which general categories of weapons they will use, their offensive and defensive AI, ability to strafe or circle opponents and similar behaviors. They don't add new skills, abilities or spells. I tried to include a good mix of offensive and defensive builds and hybrid ones such as Berserker (dual-wield) and Spellsword. Please refer to the PDF guide for details. A combat style is only applied while the Follower is in your service but is non-destructive to the character "template". - Combat Styles are applied by affecting the follower's combat package. You can also attempt to use it on an imported follower but there's no guarantee that it will work and if it does may completely change how they function in combat. It should not break them as you can change it to default to set them back to their default combat package. - Imported followers can now benefit from Combat Role and Combat Distance IF you are using a Combat Style on them. - Bleedout Recovery setting the MCM has now been reversed. It used to be "Enable Bleedout Recovery" but is now "Disable Bleedout Recovery". If enabled, blledout recovery during battle will be turned off for followers. The default setting is now off. - Possible fix for odd follower issues that some folks are having. With this fix, I'm going to strongly recommend that you have USSEP installed for Skryim SE or USLEEP installed for Skyrim LE. This removes the "Uses Stored Text" flag from the Aliases in this mod, which might be helpful for some people. We will see. Rebuilt the SEQ files for both games, just in case. - Improved Follower Horse Dismounting. Followers are more responsive in dismounting when the player dismounts. If a follower is somehow stuck on horseback, if you mount then dismount, they should dismount their horse. Only applies to horses provided to followers via this mod. - Stored gear now automatically is re-applied when re-recruiting a Follower. Only applies to stored Adventuring Gear. - Mod updates should now only show once. When the mod is first installed, you should only see installed once (this is correction to a general issue with the game when using OnInit). Rebuilt versioning routine. - You can now give any follower a Nickname. This changes the name that is displayed in game (not their "true" name). It is permanent but can be reversed by setting their nickname to an empty name or using "none" as the name. When giving a nickname you can be creative and spaces are accepted. This is intended to be used with guards or other expendable recruits but can be used on virtually anyone. Note that there may be some followers who are part of a quest that might change their display name. This setting is found on the Follower page in the MCM. Technical info: This only changes the Follower's "display name" not their "true name" and you can always revert them to their original name by clearing the nickname entry in the MCM. - Notifications by the Framework show Follower nicknames where applicable. - New debug feature, Expel Follower. This allows you to dismiss a Follower, even if she is not in the framework for some reason. It can be enabled in the MCM under System and shows an additional dialogue choice, "I no longer need your help (Expel)." Though it is for helping users with issues, you can use it in place of the regular "Dismiss" option, as it will remove Followers from the framework if they are in it. - You can now control Idle Chatter of followers. This setting is in two places. The main setting is found in the Interaction menu of the MCM and allows you to choose between On, Off and only when Sandboxing. The second setting can be set on a per-Follower basis to only affect certain followers. Setting the main setting to Off, will affect all followers, regardless of their individual setting. Followers will still comment if you bump into them, are in combat or are told to speak through an event (dangerous enemy, seeing a cave, etc). Idle Chatter settings will not affect Custom Followers. - Some abilites have been removed from the framework, as they now exist on the Command Followers ability. This is an attempt to streamline the mod a bit. Removed: Set Adventuring Gear and Summon Followers. - Reset Follower Quest has been changed to Restart Main Quests. This feature, in the MCM, will remove all of the followers from the framework, reset their factions to a state before they were following you, clear all the aliases from the vanilla follower quest and the import followers quest. Hopefully this will provide a better reset if you need to use it. - The framework now has a well organized readme in the form of a pdf that has been written from the ground up. The update list is now a separate text file. -- Recruited Bards that are singers no longer attempt to change location to auto-start singing songs. This is done with the "BardSingerNoAutostart" faction and is only temporary while they are in your service. -- Only Unique Non-essential NPCs can be set to essential. Also, Uniques set this way can be rehired. -- The following features are blocked from Levelled NPCs (Guards, Soldiers, etc that have no unique name): Storing Adventuring Gear, Set Essential (as above) and Learning Spells. This is a cautionary measure, just in case derived actors from a base actor could be affected. You can still do other things like set their role, mount, etc because you can always change it if it causes a minor issue. -- Conflict resolved that caused Adventuring Gear to make a Follower naked upon entering a new cell. -- Shield and Headwear properly stored when exiting MCM menu (if those features activated). -- Shield correctly detected and hidden on cell load/exiting combat. -- Updated storage function of headwear and shield. - Corrected some Papyrus errors concerning the GetName function. - Enemies that are bleeding out are not counted for purposes of allowing a Tank to Taunt. Also, bleeding out enemies are not affected (irrelevent, they can't move or attack anyways). - "building charge" no longer shows when auto-recharging weapons, it was for internal use. - Removing the adventuring gear dialogue in the MCM should also actually remove the dialogue. - Adventure gear slot labels are now accurate. - If a follower has died and somehow remains in the framework, sorting the slots will remove it. - No longer accidentally adds some animals to the framework when looting. This happened because skyrim adds some animals, such as stray dogs, automatically as party members/pets when interacting with them, including examining a dead body. - Bleedout setting is now applied to all followers upon game load. - Sorting Slots function removed from new installations. - Helmet should be removed more consistently after combat, if using that option. - Helmet from an outfit is stored as the current helm, if using that option. - Allow Bleedout Recovery now is properly set in the MCM menu. -- New visual and audio. Audio is different between male and female followers. -- No longer knocks down physics-enabled objects. -- Reinforced that only hostile targets are affected. - Verbose Activity setting in the MCM removed and split into toggles for Taunt, Recharge, Heal, Storage of Headwear and Learning Spells. Found under System in the MCM. - You are notified if a Follower cannot learn a spell from a book, if toggled under MCM. - Headwear stored only displays if toggled under MCM. - Command Follower ability redesigned. -- If facing a Follower, a menu specific to her will appear (they will glow slightly). Follower can be commanded to Wait/Follow, Trade, Favor, Set (Adventuring) Gear or be Dismissed. Wait can be set to perpetual (and sandbox). Favor brings up the game command cursor (they will stop doing a favor if you escape out). Fires an invisible projectile to target the Follower, so can be used fairly far away. -- If no follower is under your crosshair, a menu shows up that affects ALL followers. In the "All Followers" menu, you can have them all Wait/Follow, Toggle Sandbox, Combat/Follow distance, Summon, Dismiss. If you accidentally have targeted a follower but you wish to issue commands to all of them, you can use "All" to go to this menu. - Allow Expendable Recruits feature added. -- You can now recruit non-essential, non-protected NPCs as followers. Typically, this is more useful for guards or soldiers, but any expendable townsperson can be recruited. This is more of a novelty feature but can be used for immersion purposes. It is experimental at this time (doubtful it will break your game). -- You do this via a dialogue by bribing them with gold. The more gold you offer, the greater the chance they will join you. If they deny your bribe, you cannot attempt it again for 2 hours in-game time (dialogue will auto-fail). -- Once recruited, they are added to the framework and most features will work on them. They will be added to their own faction (for tracking/dialogue purposes) and not to the vanilla current follower/potential follower factions. They are protected like any other follower in the framework. Does not alter any vanilla dialogue, they use their own custom "follower" lines from shared dialogue. -- Some townsfolk will have their vanilla dialogues, so use your best judgement when interacting with them. For example, an innkeeper will have the rent a room dialogue but if you are far away from the inn, it's best to avoid selecting that. Children can be recruited if you have a mod that allows them to be killable but will not fight unless you have a mod that enables this. -- You can dismiss an Expendable Recruit as normal. However, if you dismiss them in an area where there are opposing faction members, there may be chaos. -- Eventually, hiring the same NPC over and over will make them comfortable with adventuring with you, especially if you have been generous with the gold when hiring them. When this happens, the recruit dialog will change to "Care to join me again?". This can take between 2 and 5 rehires. -- Someone suggested this idea and I felt there were a lot of RP possibilities and a lot of ways to use NPCs to do things differently in game. Example 1: You normally only have 1, maybe 2, followers and there's a tough fight ahead. You bribe a nearby guard to help you fight. Example 2: Considering you have the appropriate mods (children can fight, killable children, etc), you take your son along with you in a few of your adventures to help him learn to be a tough warrior. -- It only needs to be used once on an NPC and will cause them to match the player's level, level with you and set maximum level to 100. -- If at any point ConsoleUtil is ported to SSE, I will integrate this into the framework. - A new option under Sandboxing (in the MCM), allows Followers (and other NPCs) to sandbox between multiple levels of buildings. Off by default. - New option, Shield only in Combat, causes Followers to unequip their shield when not in combat. - Followers now more reliably update their adventuring gear when entering a new cell. - Some general fixes and improvements across the board. - Reworked the MCM menu for layout. The "General" page is now split into "Interaction" and "System". Interaction more or less affects the interactivity of Followers. System is more along the lines of core features, support and abilities for the player. - Some items in the MCM menu have been renamed and the new pages have new categories. Their functions are essentially the same unless otherwise noted. Hope nobody gets confused or triggered but it looks better. - New mod versions will automatically sort follower slots upon game load (after version update notification). - Sandboxing now has a dropdown to switch between Off, Allow, Allow with Autoboxing in Town or Allow with Autobox at Home, as they use the same global with different values anyways. - When choosing a storage slot for Adventuring Gear, you now have the option to cancel. If is the first entry (- Cancel -). - Reduce Infighting is a new setting in MCM under "Combat" that attempts to keep followers from fighting each other when they use spells with hazard or area effects. It instructs them to stop fighting if they are targeting a teammate. Turn this off if you actually need to fight a follower for some odd reason. - You can now set the Catch Up Teleport distance and time checking interval in the MCM menu under "Movement". - Verbose Activity is a new setting under "Actions" that you can turn on or off. If on, you will be notified if a Follower heals you, recharges their weapon or taunts. - You can now set your Followers to automatically recharge their weapons via a dropdown menu. Followers recharge at a flat value (150 points) with a bonus based on their own Enchanting skill. This occurs more often in large combat scenarios but generally is between 2 or 3 combat events. There is a flash, similar to an armor spell, when they recharge their weapons. Even if auto recharge is being used, you can still give Followers filled soul gems to double-down on their recharge capability. - Big Role update, there is now a Tank role available. Follower must have a minimum Stamina of 40 and works best with someone who has block ability (shield or 2-handed weapon), though you could have a mage tank if it amuses you. When in Tank Role, the Follower will periodically do an AoE Taunt around herself that will do a small amount of damage to hostiles and try to direct them to her. Taunting costs 40 stamina and can only be done every 15 seconds. While Taunt is on cooldown, the Tank receives a buff that increases her Health by 100 and her Blocking skill by 10 (these are flat bonuses because there's no other safe way to do it right now). - Taunting will only occur if the Tank is relatively close to the Player. Taunting may not pull the enemy off of you if you continue to engage that enemy and at times the enemy AI will do what it wants to anyways. It might be best to have one Tank, otherwise Followers will Taunt off of each other constantly. Taunting doesn't favor stronger opponents or do anything super-smart but the Follower will not taunt if no enemies are around. - Adventuring Gear formlists (slots) have been reworked and are now more reliable. GetItemCount is also not used as it gives false positives when using leveled gear. In other words, Followers should no longer forget Adventuring Gear you've assigned to them. - Updated methods are used to record Adventuring Gear so that player-customized gear is used where possible. If you are using enchanted (by the player) or smith-improved gear, make sure that the Follower you set this up is not also carrying non-enchanted/smithed versions. We still have to use formlists to record the base form of each item and this can be fooled if your Follower is carrying 3 pairs of leather boots, with only one of them enchanted (for example). Object References (that you find and use in-game) can only be "stored" in chests and I'm not at the point where I'm going to add 25 chests to hold and check against all the gear Followers are wearing and have stored. Will cross that bridge if it becomes necessary. - A Follower's Gear list will show it's base names, not custom names. This is just a limit on how things are displayed. - Followers can recharge their weapons with soul gems, option is under General in the MCM and off by default. You may give a follower any number of filled soul gems (must not be player filled and the ones you buy from merchants or find in the world). After combat they will fill their weapons using the lowest filled gems first (order goes petty, lesser, common, greater, grand, black). They will not overfill weapons and will wait until it's charge is expended enough to fit a full gem's worth of energy. Recharging has a cooldown of about 2 game hours (6 minutes real time). When a Follower recharges their weapon or have no more gems in their inventory to use, you will be notified. You are also notified if you trade a soul gem with them that they cannot use (player filled gems or special quest gems). The gem limitations are game-based. - There is a new player power that can be activated in the MCM, under general. Calm Followers allows you to calm all Followers around you (2048 units). They will stop combat and have their aggression lowered for 60 seconds. This is identical to Voice of the Emperor except that it can be used at-will and only affects Followers and teammates. - Reworked Sandbox routine to be more snappy. You can now set the Relaxing Time in the MCM, which is the number of seconds the player must settle before followers will sandbox around. - Followers can now be set to Automatically sandbox while in any interior city or town building. You can also opt to only have them auto sandbox in your homes. While sandboxing in this way, they will continue to do their own thing while you move around in the building. However, there are several "breakers" that will cause them to automatically follow you directly again: drawing a weapon, being in combat, moving 4096 units away from them or moving into an exterior location. - You can define a location to be a Custom Sandbox Location in the MCM menu, under General. If using Sandbox only in Town or Auto Sandbox in Town, Followers will include this location as also eligible. The option only shows if you are currently in a location that is supported and is not already defined as a city, town or home location (via keywords). This option can be used to have followers sandbox Fort Dawnguard, for example. - The General MCM page has been reworked to better accomodate available space. - There are a couple new game settings added to help with follower positioning: iNumberActorsAllowedToFollowPlayer (set to 15), fFollowExtraCatchUpSpeedMult (set to 5.0). - Checking outfits, horse and helmets are more performance friendly (Follower Alias script). - Horse packages have been tweaked to no longer cause odd following issues. - Some functions where adjusted to work better when keeping horses around under General of the MCM menu. - Several alias package functions are tweaked and should perform better. - MCM changes that affect real-world appearances (horse skins, effects, etc) are now cached as you pick them and carried out once the MCM menu is closed. - Going in and out of sandboxing is now more reliable. - Auto warp is now more reliable. * It is a good idea to use Sort Follower Slots on the slots tab of the MCM menu after installing this update. If you were using Adventuring Gear, you should redo those assignments if those Followers weren't reapplying their gear properly. - When setting a follower's Adventure Gear, custom enchants and naming are no longer removed. Improved SKSE functions are now used. When enchanting a follower's gear, you should set up their Adventure Gear again. - Horse options have been somewhat overhauled. -- In the MCM under General, Allow Horses was replaced with "Mount Support". There are 4 possible choices: No Support, Spawned Horses and Riding Support Only. No support provides no horse support at all (Convenient Horses). Spawned Horses spawns horses for Followers (unless they are excluded) and gives them access to riding packages. Riding Support Only just provides riding packages without spawning any horses (Immersive Horses). It is possible to have some followers spawn horses and some not and still use riding packages, see below. -- In the MCM under Followers, Allowed to Use Horse set to off will still give a follower access to horse riding packages. Keep in mind that if you are using Immersive Horses, mixing and matching between spawned and not spawned horses might confuse some followers. -- Follower Horse FX - You can now apply special effects to a follower's horse when using spawned horses. There are 4 possible effects: Fire, Frost, Ghost and Shadow. Special effects will combine with horse skins and are remembered on a per-follower basis. -- Followers will move quickly to a horse when the player mounts. -- Spawned Horses now appear away from the player. -- When switching a follower to not use a spawned horse, the horse vanishes. -- You can keep spawned horses around, under General, for immersion. If a horse is too far away when the player mounts, it will be summoned. - Followers Close, Medium, Far Follow ranges adjusted for non-combat and combat. All are somewhat closer relative to their previous values. - Followers now properly set to use a Horse by default when first recruited (fixed again). - Fixed a couple of bugs when using the Command Power to command a single follower. -- Followers correctly cycle in the order of their follower slots. -- The correct follower is selected when issuing a command. -- Dismiss no longer accidentally dismisses more than one follower. - MCM now correctly shows Mods that are internally supported instead of "$" variables. - MCM text hopefully makes more sense and is corrected in some places. - Circlets should now be supported when using Headwear only in Combat. - Followers now switch faster between Run and Walk states, off by default. Set in the MCM General menu. - Followers should react faster when told to wait or follow. - Force Equipment has a slight re-design. -- Now referring to it as "Adventuring Gear", as in the gear your follower wears while in your company, versus their normal gear. This sounds more fanciful and less scientific that "Force Equipment" did. -- You no longer need to trade with a follower to take their previous Adventuring Gear back. When setting up gear, their currently used items are removed and placed in the trading pane. This also allows you to quickly refresh their Adventure Gear, if you need to, by using the dialog (or power, below) then canceling. -- Adventuring Gear items are listed in the MCM menu under the Followers page, for that Follower. -- You can removing gear managment from a Follower from the same page. -- There are now 15 storage slots you can use for Adventuring Gear. These slots memorize the gear you define and are used to automatically re-apply their Adventuring Gear if you dismiss and then recruit them later. A slot's contents automatically updates if you change what gear they are using. When using the slots dropdown, clicking on the slot of a different Follower than the one you are viewing will replace that slot with the current Follower. If a slot is already defined, clicking on a different empty slot will move the Follower's slot to that position. Followers will eventually use their Default Outfit shortly after being dismissed - storage has no effect on that. -- Though the dialogue option remains, you have the option of using a fire and forget power to set up gear for a Follower. This can be activated in the MCM and assigned as a favorite with SkyUI if you wish. To use, just face the Follower and press the Power/Shout key (Z). -- Backing out of setting up equipment for a Follower to wear no longer clears their Forced Equipment. -- The dialogue option is still available if you want to use it that way. However, it now leads directly to the trading pane. - The Show Forced gear dialogue option has been removed and is now listed in the MCM. - Clone Outfit dialogue option has been removed and is now listed in the MCM. - If a Follower uses Headwear only in Combat, that item is shown in the MCM. - Followers can be taught spells by trading spell books with them (beta). It is off by default and can be set in the MCM under General. -- When trading a spell book, if the follower doesn't have the spell AND has enough magicka to cast it, they will learn the spell. If the spell is learnt, the book is consumed. Trading books offering that same spell (or multiple copies of the same book) in the future will trade the book to them as normal. -- You are notified if the Follower actually learns the spell ("Serana learns Firecloak", for example). -- Learning a spell doesn't necessarily mean the Follower will cast it and this is determined by the AI engine in the game. Followers will use these kinds of spells most of the time: direct damage spells (destruction), summoning spells (conjuration), healing spells that will heal themselves (restoration), armor/cloak spells (alteration) and possibly others. I would avoid allowing Followers to learn "bound item" spells as it used to cause CTD - it is unknown to me if it still does, I don't use those spells. -- It should work fine with mods that add new spells to the game as long as those spells can be learned from books AND the book has the "VendorItemSpellTome" keyword (can be bought or sold to a vendor). -- Avoid teaching spells to Followers that are solely intended for the player or are part of a mod to add some kind of spell/feature to the player (only). - Support for Interesting NPCs. There is an option in the FOMOD. Replaces one script of iNPC. They will work like vanilla followers. - Fixed an issue where the first 4 followers would not use the Healing role. - Followers are now set to use a horse by default if horses are enabled. - Spacing between followers increases when mounted and returns when dismounted. - Reversed a change. Dismiss all Followers no longer removes imported followers. Was causing issues with some custom followers. It is recommended that you sort the character slots OR dismiss and re-recruit your existing followers after this update. - The 5 Follower + 5 Animal Slots are more flexible, turning them into 10 total Slots. Now able to recruit 10 Followers or Pets total, your choice of mixing them. You shouldn't need to dismiss/re-recruit your current roster. However, it might be a good idea to sort the character slots via the MCM. - Slots are now displayed as "1st" through "10th". It still fills slots from high to low but to avoid confusion, full words are used with "1st" meaning the first available slot (or slot being looked at). - You can now set Followers to not recover from bleedout during a fight until combat ends. This does not persist if you dismiss them, only while they are in your service. Under general in MCM. - Equipped items via Force Equipment now moves between Followers when using Sort Aliases. - Creating a copy of an outfit no longer has a one-time use. - Restructed some of the procedures of the Healer package to make it work more reliably. - Many internal fixes and tweaks. - You can remove (or add) the "Summon Followers" power via the MCM. - Imported Followers are now removed from the Framework when dismissed, either via their own dismiss dialogue or by the Command power. You will need to wait a few moments as they need to be detected that they are not in the Framework. - Readme hopefully more in line with recent changes. - If the player is mounted and Catch-up is enabled (or Summon Followers is used), Followers will warp to the player. If Horses are enabled for Followers, they will attempt to mount them. - New (immersive) equipment menu shown near "I need you to trade some things" when speaking to a follower. Force equipment, Show Forced Equipment and Copy Equipment features are here. You can turn this dialog on/off in the MCM. - Recruit as blade is shown in the main follower dialogue if you are at a certain point in the Blades quest where you can recruit Blades. You can hide it by using the MCM if you don't care about the Blades. - "Remove from Framework" is now shown on the main dialogue of a follower (near the bottom) if they have been imported. - MCM is more robust with updated descriptions. Can now set defaults of most items. - Follower/Import Follower settings moved to MCM as the Follower page. - Show Stats moved to the MCM, showing all Skills and Resistances. On it's own Stats page. - You can toggle between followers on either page, above. - New language strings added for MCM and for scripts to make it easier for translations. Due to the way strings work, not all of them can be converted over. - Some MCM toggles now work more reliably. - Potential number horses increased to 10, one for each humanoid follower. - You can now pick the skin of Follower horses (MCM) globally, between Brown, Black, Black and White, Grey, Palomino, Shadow or Cairn. - You can now set a horse's skin specifically for any Follower. Choice is remember even if you dismiss them and recruit them later. - Horses are set to ignore friendly fire. - Horses don't affect stealth meter (if they have remained for some reason). - Mounting and Dismount functions/packages are more responsive, especially with sandboxing turned off. - If the player enters combat while mounted and Followers dismount, their horses will disappear so that they aren't in the way. - Followers will attempt to summon horses if the player is mounted during combat and combat ends. - Horses that die by being pulled into combat are now resurrected when a follower attempts to call a horse. Combat monitoring is not being implemented at this time. Keep in mind that Follower horses are only to solve a transportation issue for followers and may resist (or break) being customized by other mods. Will look into some quality of life features but this is not a horse mod. - Implemented a simple catch-all for false positives when recruiting some followers. Some follower mods that work into the vanilla system can have their own ideas about recruitment/dismissal and you might see false "Come with me, I need your help" type options even though the follower is already with you and in the Framework. This just adds another check to keep it from double-recruiting and so on. Fixes some papyrus errors as well. - Removing Follower no longer resets "don't use helm" faction. You might need to reset "Only Use Helm in Combat" on previously dismissed Followers. - Equipment is not checked (force equip) when Follower changes location - it is spammy. Instead, OnAttachedToCell event is used, added slight delay. - Equipment, when checked (force equip), is now quickly unequipped then equipped to hold the change. - Followers no longer try to keep a constant speed while mounted. - Fixed some menu dialog issues where items might lead back to the wrong section. - Create Copy of Default Outfit: You can now create a copy of your Follower's default outfit. The intent here is to allow you to enchant or temper armor on a follower that you don't have access to. This could be very unsafe or weird depending on who you use this on, so use with caution! For now, to prevent the temptation to dupe items, you can only make a copy of a Follower's outfit one time. - Called Horses have a speed boost to help keep up with the player (+25%). - Fixed an issue when detemining number of Animal Followers. Was stopping at 2. Correctly counts to 5. - Some bug fixes here and there. - Phase One of MCM Menu support. Not everything is there yet as I am very new to it. All General Options are in MCM. All Follower and Pet Slots and Sorting Slots is in MCM. - English translation file included for MCM features. Those wishing to translate to other languages can use this file. - Horse System is now available to Followers (yes, works with Imported Followers). This is a new, beta feature. 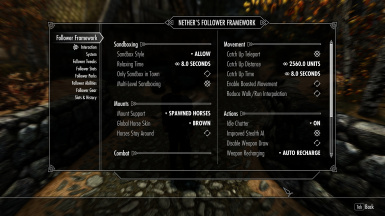 This is just a simple system for those that don't want to use the beefier horse mods. When you mount up, your followers summon a horse and ride it. When you dismount, followers do as well and their horses disappear. Horse colors alternate between the darker horse skins. It's likely going to stay simple with possibly setting horse skins in the future. Followers will not fast travel on horses. - When Sandboxing, followers now sandbox around themselves (768 units) instead of the player. They will also attempt to move away if getting too close. This causes them to collide into the player far less. - Fix for Pressure Plates being set off by some Followers (Meeko! Why?). - Fixed a CTD caused by Hide Headwear applying changes before 3D loaded into the cell. - Fixed Controller Script from attempting to use an invalid Reference Alias (cleared Papyrus errors). - Follower/Pet Death now shuts down the NPC properly. Really only important if the player wants to resurrect a follower using the console. - Force Equipement slightly redesigned. It still forces items to be equipped as before. However, it also stores equipped items in a list. When the player loads a new save game or changes loaction, they will equip these items if they are in their inventory. This will give Force Equipment a similar behavior to Outfit management. You should re-apply forced equipment if you used an earlier version. - You can check which equipment is marked to be forced under the main tweaks menu. - Reduced Hide Headwear unequip time to 4 seconds (down from 6). - When using Hide Headwear, changing locations/loading the game it may take up to 2 seconds to allow headwear to update. - When teleporting to the player in an exterior cell, followers won't appear as close. - Added Equipment/Helmet cleanup for Dismiss/Remove Follower. - Followers/Pets attempt to slow down when approaching the player to help prevent them from slamming into you. Does not affect Imported Followers. This is not working fully as intended so is a work in progress. - Entry for Force Equipment changed in the readme. - "Actions" text changed to "Options" in the menus. - Follow Distance between Followers and the Player now feels more logical as the default space between followers game setting is now adjusted. You should notice a distinct difference between Close, Medium and Far now. Affects the fFollowSpaceBetweenFollowers game setting. - Combat Distance also adjusted as above. Affects the fCombatTeammateFollowRadiusBase and fCombatTeammateFollowRadiusMin game settings. - Force Equipment and Show Stats is now moved to the main "Follower Tweaks" branch so that it is quicker to access them. Settings related items remain in a submenu. - Force Equipment now allows a wider variety of equippable items. - You can now set any follower to hide their headwear when out of combat. Setting is found under the Follower Actions menu. Once enabled, trade any headwear item with them and you should receive the message "Headwear Stored for (NPC)" and they will remove it once you exit the trading menu. If you dismiss the follower then later recruit them you will have to trade the headwear item again with them again. Also works with Force Equipment, though the headwear will not be force equipped once the npc removes it. Does not affect headwear assigned through a follower's default outfit. - It is now much harder to have incidents of Friendly Fire in combat. iFriendHitCombatAllowed has been raised from 4 to 15. - You can now set Followers to not draw their weapons when you draw yours. This can be set under General. It is a global setting and also affects any temporary teammates. - The Framework now prevents the same actor (Animal or Follower) from being added to Follower Slots by doing a quick check prior to Recruitment. This is a quick fix for allowing stray dogs as animal followers so that they don't keep adding in multiple times. This fixes animals such as Meeko. I tested this with Garm for SSE and he would need a small patch to finesse the "Garm joins you message", which I need permission to create (he isn't actually recruited more than once). - Real-Time Count Check adjusted for Pets. - Note that version number is still 1.1, internally, so there's no update message. - Follower Aliases are now all set to Protected. - When recruiting a Follower for the first time, you aren't told that they are in the default role. - Corrected a bug in the Healer AI. - Improved Stealth AI behavior, crouching delay removed. - Fixed an issue where you could only recruit 2 Blades. - Added check for current follower to Import Follower. - Force Equipment no longer makes a follower naked if you don't put items on the equipment side. - Can now set Followers to Essential (or revert them to their previous status). If a Follower is Essential by default, there is nothing to see. Keep in mind that anyone following you is Protected via their alias, so they will always show as protected under show stats. This change persists if you dismiss the follower. Use with caution. - Framework now supports 5 Animal Slots (I am calling "Pet Slots"). Like Follower slots they fill from high to low, so you'll fill slot 5 first. These slots are separate from Follower Slots. They can use nearly all the benefits that Followers have under this Framework. You cannot set their role or force their equipment. Pets will also ignore friendly fire and you can issue them commands. Custom Followers that you download and happen to be animals can often be Imported and if so, will not use a Pet Slot, they will use a Follower Slot. In other words, all custom followers are treated the way under Import. - Command Follower ability added. You can issue commands to all followers via a quick menu - Wait, Follow, Summon and Dismiss. You can also issue these commands to any single follower (or pet) - it starts with the first follower you recruited and then you can cycle through them. - When selecting Wait via Command Follower, you can elect to choose Vanilla Wait or Perpetual Wait. Perpetual Wait lasts forever and causes a Follower to sandbox the area. - Essential, Protected or Not Protected is shown under Show Stats. Remember that since all Followers and Pets are protected, this can show false positive as "Protected". - A Follower in Healing Role will now heal the Player out of combat. - Removed Gather All Followers function. Didn't really do anything exceptional or useful. - Removed All Followers submenu under Follower Tweaks. Redundant with Command Follower ability. - Count checking updated to check/adjust animal count. - You can now show Follower Slots and Pet Slots, each under a separate menu. - If you sort followers, it will sort both Followers and Pets, regardless of where you select it from. - Several code changes. Some of this is optimization, some to allow pets. Looking for a multi-follower framework that is easy on game resources and gives you the choice between animal or humanoid companions, with as little as one or as many as 10 at a time? How about a system that also provides a wealth of interesting features, both immersive and quality-of-life, to allow you to tailor the framework to your own style of gameplay? 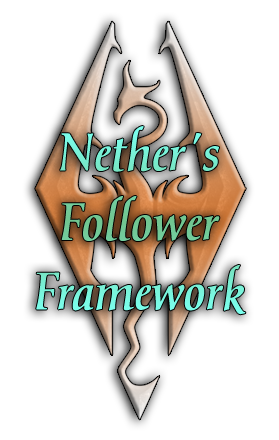 Look no further, Nether's Follower Framework is that and more! - Be compatible with as many other mods out there as possible, so that you can use it alongside your favorites. - Provide companion features that are familiar and useful but also engaging and interesting. - Make preferences optional and undoable, so that companions (and your game) don't get broken along the way. - Offer interesting options but also keep it resource-friendly and script-engine light. This framework is intended to be used with followers that use the default follower system. In other words, hook into the standard Dialogue Follower quest (most companions on the Nexus). However, there is also an optional feature that allows you to Import custom followers so that they can also make use of many aspects of this mod (no guarantees, of course, but has been tested with many unique followers out there). This mod does require SKSE and SkyUI, but those components allow me to deliver streamlined and engaging options to you, that wouldn't be possible without. NFF is crafted by a follower fanatic with many years of gaming and programming experience who loves putting together a rotating group of adventurers together to accompany his dragonborn on adventures in Skyrim. For the Nerds! (ahem...) Nords! - Up to 10 Followers (flexible, can be humanoids or animals). - No starter bow or arrows. - Explicit support for Serana and Sofia. - Plenty of options, below, all at your choice, set with a robust MCM menu. If you don't like something, it's very likely you can turn it off. - Detailed PDF Guide provided, for explaining all features. - Optional (vanilla + DLC) scripts replacement if you have a problem getting the framework to "stick". Option as well for RDO. ﻿﻿- Allow Followers to Sandbox when you are doing passive tasks. - Set Followers to only Sandbox In-Town. - Auto-Sandbox in Town Interiors, Your Homes or Locations you determine. - Toggle off for any specific Follower. - Allow Followers (and other NPCs) to Sandbox multi-level interiors. - Followers can be individually set up to craft and/or interact when sandboxing. "Craft" in this sense is not a sim, but it does give them something actual to do while hanging around with some minor conveniences/buffs. Interaction is currently limited to ordering drinks at the taverns. ﻿- Allow Followers to use spawned horses provided by this mod. - Allow Horses to disappear when not being ridden or have them stay around. - Select breed and effects of their horse, select breed globally. - Place Followers in a Healer or Tank Role. - Choose from 10 different combat styles for Followers. - Reduce Infighting between Followers. - Optionally Disable bleedout recovery keeping them down during a fight. - Revive fallen followers with health potions. - Can Control distance and polling time. - Enable a +25% Movement Boost for faster following. - Reduce interpolation between walk/run state changes (faster reaction). - Create/Manage up to 10 "Home Bases" for your followers, where they will go when you dismiss them. Can set up work and relax locations, optionally. You can rename Bases and all locations, move followers to/from bases and visit your bases at any time. - Regard System for Followers - relationship system that is more of their respect for you as an adventuring partner. Awards some abilities and benefits. - Improve Follower Stealth AI when out of combat. They will not initiate combat, chatter and they move in close. - Extinguish Torches when you and Followers are stealthing. - Cause Follower Torches to Expire when being used. - Prevent Followers from drawing weapons when you do. ﻿- Followers will not set off basic traps (equivalent of LightFoot perk). Optional via installer. - Followers get out of the way when you get very close to them. - Followers can Auto-Recharge weapons they use or use filled soul gems (not player filled). - Learn skills from your followers when fighting with them in combat (Affinity system). ﻿- Teach Followers spells by trading spell books to them and/or directly teaching the spells you know. Works with spell mods! ﻿- Set any Follower to Essential (or reverse it). While in the Framework, all Followers are Protected. - Change the Behavior of Followers (morality, crime, etc). - Set the Damage Multiplier of followers, affecting their attack damage. - Set up Adventuring Gear for a Follower, telling them what to wear while they are following you. This is gear enforcement NOT outfit managment. ﻿- Storage system for re-applying Adventuring Gear when re-recruited. - Copy their default outfit into your inventory (for custom armor, mainly). ﻿- Set a Follower to only use headwear while in combat. - Set a Follower to only use/equip shield while in combat. - Blades compatibility for multiple followers plus the ability to give followers the blades gear instead of changing their base outift. - Issue Commands to all Followers or individual ones at a distance. - Commands for All Followers: Wait/Follow, Toggle Sandbox, Combat/Follow Distance, Summon and Dismiss. - Commands for Single Followers (when facing follower and in your sights): Wait/Follow, Trade, Favor, Set Adventuring Gear and Dismiss. - Much like a character sheet, you can view Stats, Skills, Perks and Abilities of your followers. - Convenient History feature allows you to see where your past followers are and either move to them or move them to you. - Enlist the help of non-essential (inconsequential) NPCs by bribing them to join you, adding them to the framework. - Offer them varying amounts of gold, with more gold equaling a greater chance they will join you. - Repeatedly hiring the same NPC will eventually make them join you free of charge. - Experimental feature but works on most non-essentials, even those provided by other mods. Use with caution. They will retain vanilla dialogues, so be wary of some options while they are with you. - Divorce your wife or husband and marry someone else (follower or not!). - Apply a Weekly Follower Cost to Followers (as a gold sink). - Share the Wealth with Followers when you find big hauls of gold (gold sink). - Call Player Horse ability with hotkey support. * ﻿- Custom Followers are usually completely outside of the Framework but can be Imported to use any feature not shown with "*" above. Importing allows them to "borrow" a Follower Slot, so they count towards the max limit. 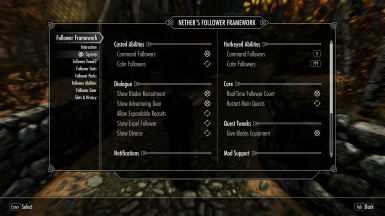 Custom Follower here specifically means any Follower with their own follower framework outside of the vanilla system (Serana, Sofia, Recorder, Arissa, and so on). This includes Custom Pets that have their own follower framework outside of the vanilla system. Not all imported followers are compatible. ﻿- Pets (Animal Companions) under this Framework use most of the features that Followers do. However, all races in the game are governed by behavior files meaning that pets will do what they want to do at times. Example: Dogs will sit when the player stops whether you have them set to sandbox or not. - Shingchen Holysee Knight Followers. The Legacy Version for Skyrim Legendary Edition is HERE. - Dawnguard - Must be installed and enabled. ﻿- ﻿Convenient Horses for follower horses. ﻿- Simple NPC Outfit Manager for actual outfit management, if you don't like the Adventuring Gear feature of NFF. ﻿I recommend using a mod manager to install this mod. It is in FOMOD format. - DialogueFollowerScript (and QF_DialogueFollower_000750BA) - retains original functions but alters their contents to segway into the framework controller script. - FollowerAliasScript - as above. ﻿- TrainedAnimalScript - as above. - TrapBear - Altered to not affect followers. You can optionally remove this script if you want vanilla follower trap behavior. - TrapTriggerBase - as above. - BladesChangeOutfitScript, FreeformSkyHavenTempleAScript, QF_FreeformSkyHavenTempleA_000E38C9 - For adapting to the Blades recruitment and adding equipment option. This is the recommended approach. You can begin your game with this mod enabled. Startup impact is minimal. Likely works best if you have never installed a multiple follower mod (AFT, EFF, UFO, etc). 1. Follow the directions for uninstalling your multiple follower mod, including uninstalling the mod. Your followers should all be dismissed. 2. Make sure your current follower is dismissed, along with any animal follower. 3. Travel to a new cell (any indoor location, for example). 5. 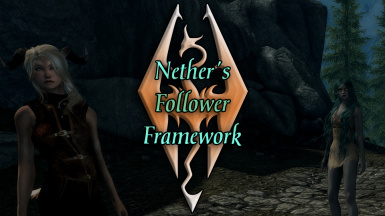 Exit and Install Nether's Follower Framework. 6. Load your game. You should get text on the screen saying that the mod is installed. 7. Save your game and then load the save you just created. If all went well you should be using the framework. I cannot guarantee it will work flawlessly in an older save file, especially one that previously had a different framework installed. You may wish (at your own peril/comfort) to use a save game cleaner. Personally I use Fallrim Tools and I haven't had an issue with it. Best behavior in most cases is to uninstall then install using the FOMOD installer. Place this mod near the end of your load order. ﻿If LOOT constantly puts it somewhere else, place near the end of your load order and make a rule in LOOT. LOOT may say to set Riding Only when using with Convenient Horses. You can do that OR turn off horses for followers you want to buy horses for using CH. ﻿The script load of this Framework is pretty light to minimal. Most of the scripts and functions are fire and forget and use game events when possible. There are some exceptions. If you don't want any Papyrus load, you can turn off some features to have zero load in real time. Sandboxing - The sandbox function uses a single update loop that checks in real time. At around 7 seconds of the player being more or less idle, Followers will sandbox. Catch-Up "Teleport" - The catch up system is on the same single update as Sanboxing but only checks once per 10 seconds. It isn't a necessary component as you can use the Teleport ability to pull all Followers and Pets to you. Check Count - This checks the follower and animal count and adjusts it occasionally (single loop in real time, quick check every 8 seconds). I do recommend you leave it on. The only time it does anything in depth at all is if my animal and follower count doesn't match Skyrim's. You can turn it off and check manually (or on location change event) - this might feel more kludgy though. Import Adjustment - Same single update loop as Check Count, this simply removes an Imported follower from the Framework. You don't use my Framework to Dismiss or Recruit Custom Followers, they use their own system so this is just a clean up as their follower system doesn't directly talk to mine. Zero impact when no Custom Follower is imported. ﻿So... If you really, truly want zero impact, turn off Sandboxing, Catch-Up, Check Count and don't Import any custom followers. You might want to try these systems first before just turning them off. These systems are actually pretty light. 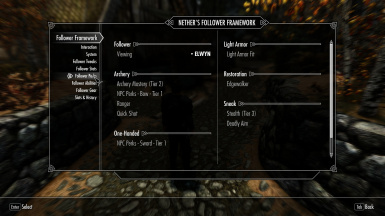 This framework will not make any followers explicitly compatible with any of the mentioned mods, except iNPCs. Mods that affect marriage or children should be fine as those systems are untouched. ﻿Not fully tested with Animal mods. In theory, most should be fine. I have tried Dogs of Skyrim so far. - Any multi-follower framework mods (AFT, EFF, UFO and similar). - Any mods that directly affect the recruitment of Blades. ﻿- Not compatible with mods that teach spells by trading books with Followers. ﻿- May conflict with any mod that enforces the following game settings: fFollowSpaceBetweenFollowers, iFriendHitCombatAllowed, fCombatTeammateFollowRadiusBase, fCombatTeammateFollowRadiusMin, fAIDistanceTeammateDrawWeapon, fFastWalkInterpolationBetweenWalkAndRun, fJogInterpolationBetweenWalkAndRun. - Mods that enhance follower combat AI will likely override this mod. This affects the Healer Role and Combat Distances. - Mods that affect how followers travel with the player will likely override this mod. This affects Follow Distance. moving out of the way, Sandboxing, Stealth movement.